October is Breast Cancer Awareness Month, and in the sports world, you tend to see teams accentuating uniforms with pink accessories. So it made sense when former Canyon Springs standout Isiah Carter asked Southern Oregon coach Craig Howard if the Raiders were going to be donning pink anywhere. Then Howard learned why he was approached by his freshman linebacker. 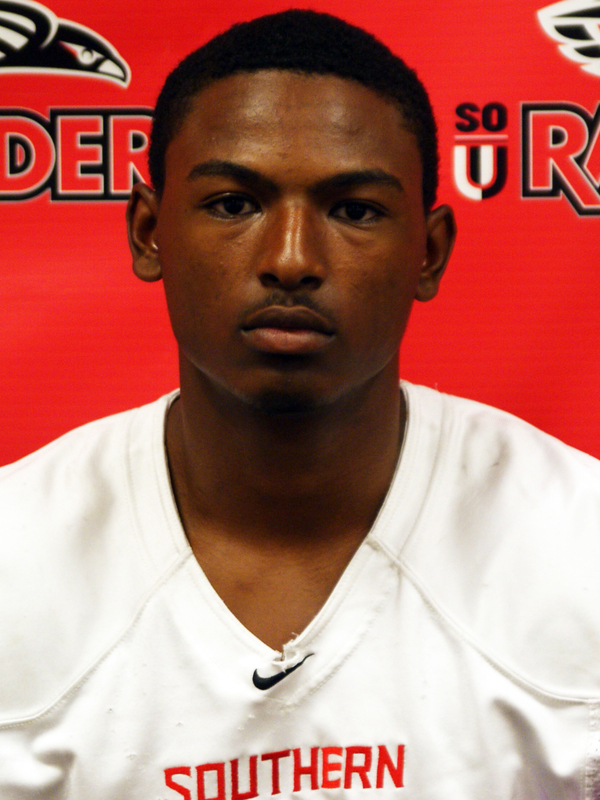 “He had tears in his eyes when he told me about his mom,” Howard said this past week during a phone interview from Daytona Beach, Fla., where the eighth-ranked Raiders will take on seventh-ranked Marian University (Ind.) for the NAIA Football Championship on Friday. Last year, on Sept. 16, when Carter was a senior playing for Canyon Springs, he lost his mother, April, to cancer. He’s been playing for her ever since. Isiah Carter started his first game the same week he approached Southern Oregon coach Craig Howard about wearing pink for Breast Cancer Awareness Month. Carter lost his mother to cancer while he was still a senior at Canyon Springs High School. Carter’s done a good job of making her proud this season, as he started his first game the same week he approached Howard about wearing pink for Breast Cancer Awareness Month, and hasn’t relinquished his role since. 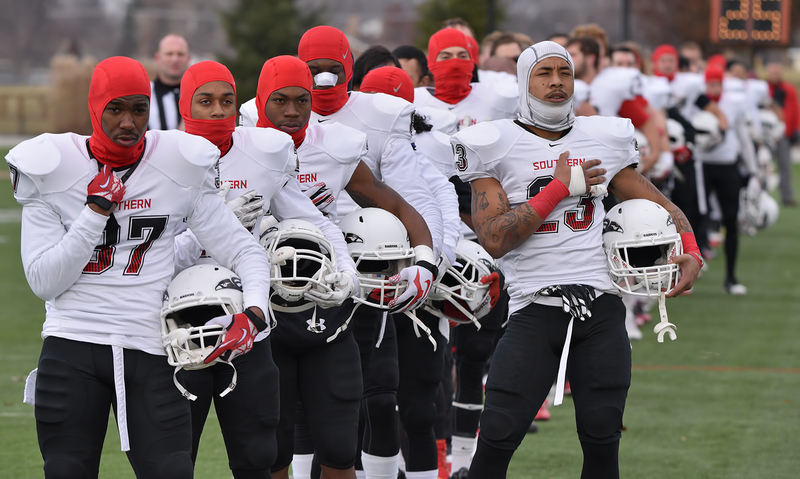 The 5-foot-11, 190-pound who graduated from Canyon Springs with a 3.7 grade point average and is majoring in business at SOU, finished fourth on the team with 75 tackles, after playing in 11 of the team’s 14 games. He recorded 10.5 tackles for loss, which ranked third on the team, and his 52 yards-for-loss ranked second-most on the team. Carter’s high school coach, Hunkie Cooper, had identical thoughts of Howard, saying he was one of the finest players and young men he’s ever coached. Cooper said he’s always told his players to remember the game is not always about them, and to find a way to play football for someone. It’s exactly what he told Carter after his mom passed, and to remind himself when he felt he couldn’t go any more, to think of someone who is on a respirator or isn’t going to make it and do it for them. Seven Las Vegas-based football players are on Southern Oregon’s football team, including Lantz Worthington (third from left). 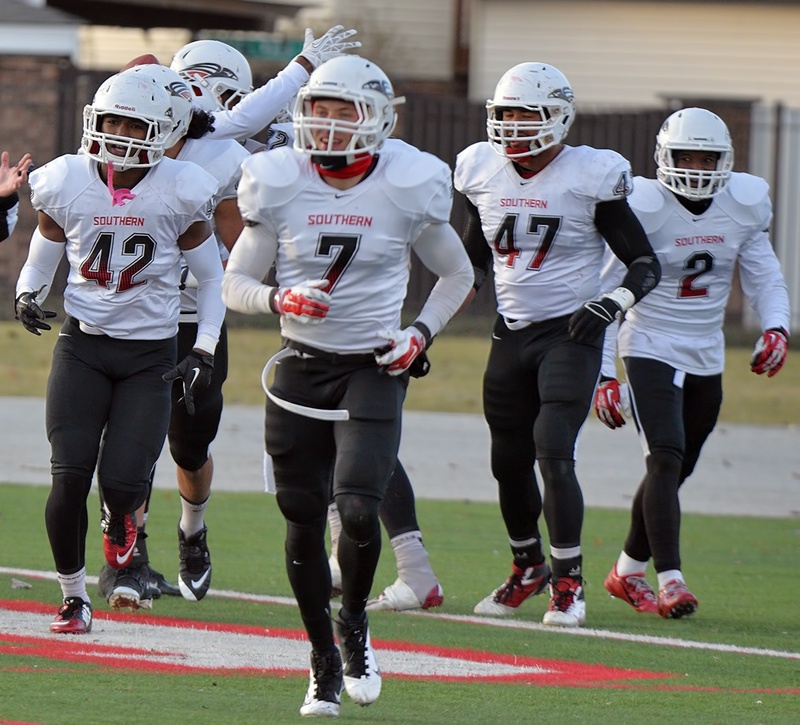 The Raiders play for the NAIA National Championship on Friday. PHOTO: Courtesy of Sports Information. If UNLV football coach Tony Sanchez (it’s okay to say that now, right?) needs proof it’s okay to recruit locally, and build a nucleus around Las Vegas talent, he should direct his attention to Ashland, Oregon – population 20,000. That’s an approximate number. A more precise number is seven. How apropos, as Vegas’ winningest number on The Strip is the same number of Southern Nevada football players who attend Southern Oregon. Why does this all matter? 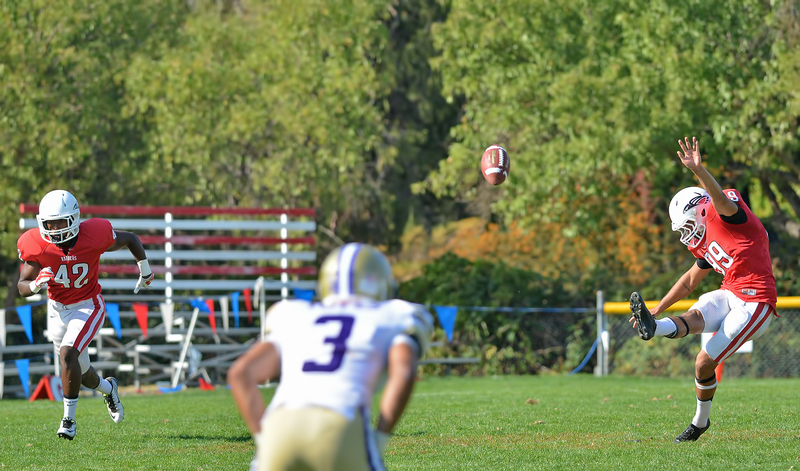 Because Friday at Noon pacific, the eighth-ranked Raiders will take on seventh-ranked Marian University (Ind.) for the NAIA Football Championship in Daytona Beach, Fla.
Yep, while the Rebels are licking their wounds after another two-win season, seven Las Vegas products may be donning national championship rings at the collegiate level. Southern Oregon, which was No. 22 in the preseason poll, knocked off third-ranked Saint Xavier, 62-37, two weeks ago to get to the final game. And history is on the Raiders’ side, as the lower seed has won the last four championships and seven of the last eight. Coach Craig Howard has a wealth of talent he can brag about, but said he has been pleasantly surprised and overwhelmed with how well his Las Vegas contingent has worked out for his team during its championship run. Linebacker Isiah Carter (Canyon Springs), running back Lantz Worthington (Centennial) and defensive back A.J. Cooper (Canyon Springs) made the trip with the Raiders, while defensive back Ray Robinson (Las Vegas), defensive back RaeQuan Bascombe (Canyon Springs), offensive lineman Terry Dodd (Cheyenne) and running back Malik Davis(Desert Pines) have been an integral part of getting the team prepared throughout the season, during practices. Cooper, who starred at UNLV and went on to become one of the biggest stars in the history of the Arena Football League, said he’s confident Sanchez will begin his recruiting process in Southern Nevada, as he knows the coaches and players, and respects what many of his now-former high school colleagues do at their respective schools. The trio who made the trip to Daytona Beach agreed wholeheartedly. Carter finished fourth on the team with 75 tackles, after playing in 11 of the team’s 14 games. He recorded 10.5 tackles for loss, which ranked third on the team, and his 52 yards-for-loss ranked second-most on the team. Worthington, who was one of the best running backs out of the Sunset Region last year, said former UNLV coach Bobby Hauck sat down with him and told him he could walk-on and make the team, but that he would not be offered a scholarship, mainly because they had been used up for out-of-town recruits and there simply was no more money left. “Honestly, I think it’ll help the program if he brings in locals,” said Worthington, who has seen limited time, but is the fastest player on the Raiders, according to Howard. “It’s the way Sanchez runs his program, I mean, Gorman was phenomenal and I feel college athletes need that kind of leader and role model as a coach. He’s the type of coach that college athletes would love to play for, and I feel it will make a big difference if he can keep kids home. In six games, Worthington rushed for just 31 yards on five carries. Nevertheless, Howard wasn’t afraid to say he’s shocked to this day he has Worthington, given how talented he is, and that he’s looking forward to him playing a lead role next season. A.J. Cooper said it’s come up often, as the season has progressed, whether or not the Vegas boys will be staying in Ashland, or if they’d like to return home to play for the Rebels and Sanchez, or elsewhere for that matter. Howard said it’s been his first move, to recruit locally, as it’s created a solid fan base, including sponsorship money from business owners who support the local team. But after recruiting from Ashland and surrounding areas, he said he knows where one of his first moves will always be after this seeing the results from this season. Given his success with Southern Nevada preps, something tells me Sanchez will be doing the same. Another week in college football, and another top-four team went down. Early in the year, without much evidence to go off of, things are fluid and a big win can cause a team to soar up the rankings. Oregon remains at the top, despite having its poorest showing of the season. 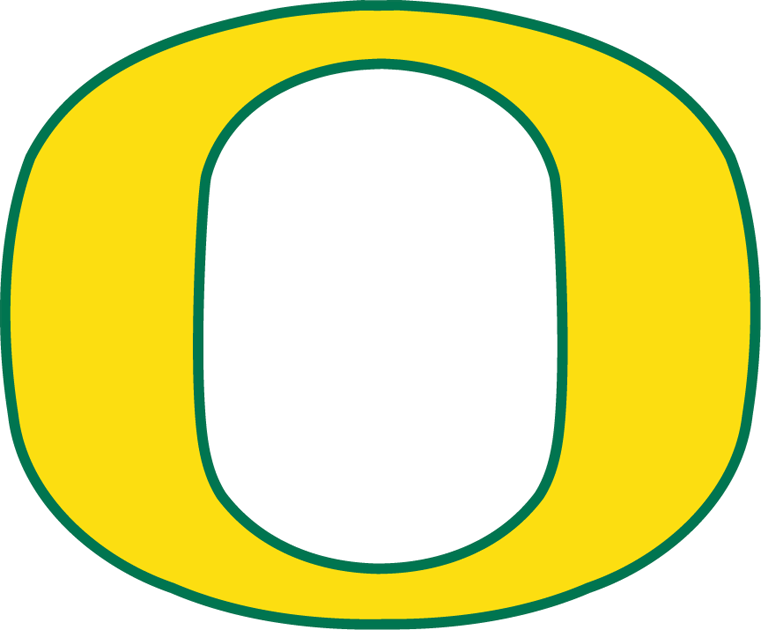 The Ducks struggled in Pullman, Washington, and escaped Martin Stadium with a 38-31 win. Marcus Mariota was spectacularly efficient, completing more touchdown passes than incompletes. He finished 21-of-25 for 329 yards and five touchdowns, but was sacked a season-high seven times. The offensive line was bad throughout, allowing all those sacks and limiting Royce Freeman to a pedestrian 3.8 yards per carry. That is a troubling sign considering Washington State is not a great defense. This performance would have dropped the Ducks out of No. 1 if any of the other top-four teams did anything of note. The Aggies beat up on a winless SMU team that has lost its three games by a combined score of 146-12. Not much of a statement, but the Aggies high-flying offense has proven to be consistent. They currently rank second in the nation in scoring at 55.3 points per game, and fourth in passing at 405 yards per game. Maybe more impressive, is the play of the defense. They currently rank eighth in points allowed at 11.8 per game, and have allowed only one touchdown since week one at South Carolina. Now Texas A&M’s schedule gets real tough, real quick. 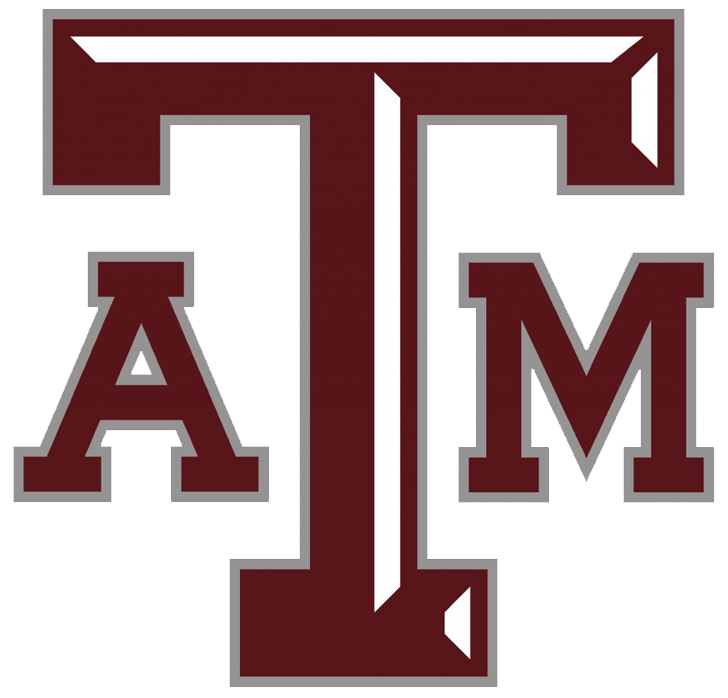 The Aggies will host Arkansas (3-1) before taking on three straight ranked opponents. There are three things that are certain in life – Taxes, Death, and losing to LSU in Death Valley at night. Mississippi State defied one of those on Saturday, going in and beating the Tigers 34-29. It was the statement win of the season, for any team in college football. It was Mississippi State’s first win in Baton Rouge since 1991, and it was in front of 102,321 Tiger’s faithful. The polls jumped them from unranked to the top 16, but that isn’t high enough. 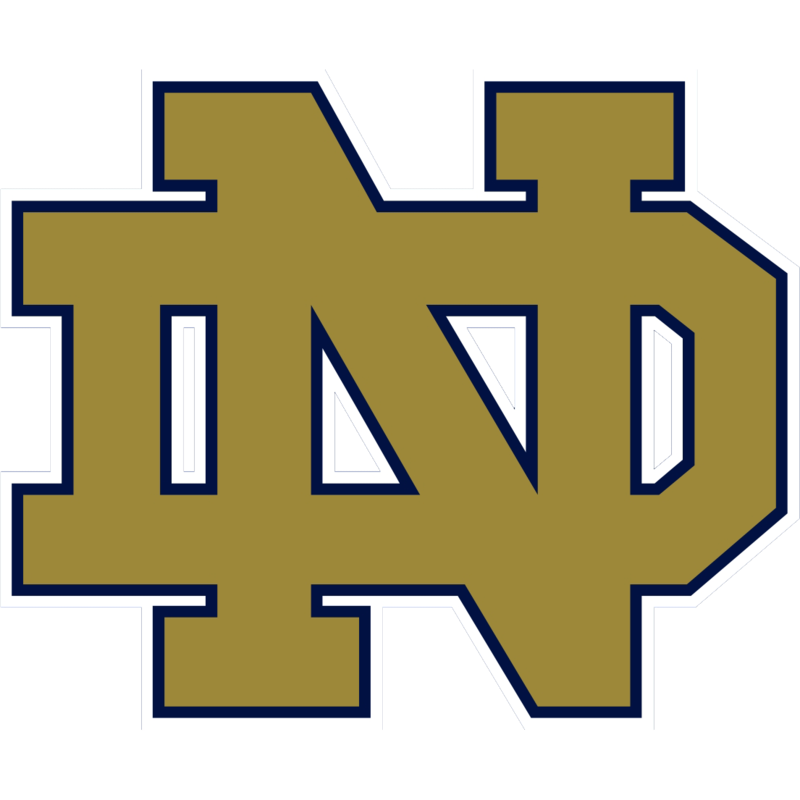 An undefeated team with the most impressive win of the year deserves to be in the top four no matter what logo is on the side of the helmet. 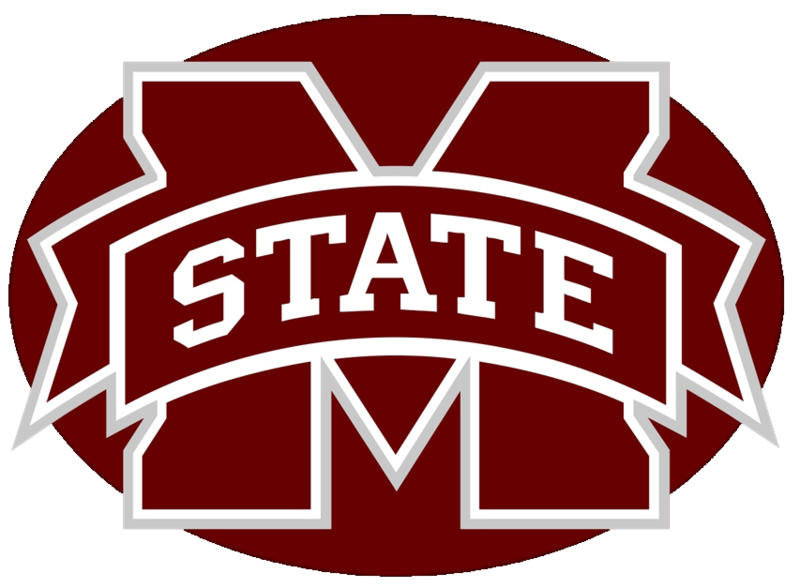 The Bulldogs’ front-seven is nasty, and quarterback Dak Prescott has vaulted himself into the Heisman race with is 268 yards and two touchdowns through the air and 105 yards and a score on the ground against LSU. Not much to say about the Irish. They had the week off, and therefore didn’t move up or down. This week they take a trip to the Carrier Dome to play Syracuse (2-1), which is one of the softest games on their remaining schedule. The Bears’ vaunted offense continues with machine-like precision. They once again lead the nation in scoring, with 59.3 points per game, and are 3rd in passing despite Bryce Petty missing time. The defense has looked great, but anyone’s defense would look great against SMU, Northwestern State and Buffalo. Baylor remains on the outside, for now. The Sooners escaped Morgantown, West Virginia with a hard-fought 45-33 win over the Mountaineers. The defense did not look good, allowing 513 yards, but the offense came though. Freshman running back Samaje Perine had a career day, carrying the ball 34 times for 242 yard and four touchdowns. Maybe most importantly, Oklahoma showed it can win when Trevor Knight is off. South Carolina didn’t look great against Vanderbilt. The game came down to the wire, when the Gamecocks should have walked right through the Commodores. But every week South Carolina’s early-season wins just keep looking better and better. Every week I will highlight the top plays from two of the most highly rated tout sheets – The Gold Sheet and Power Sweep – breaking down the plays for you, and whether or not I agree with their selections. By Thursday night, you can expect to see the top college releases, and will follow in the same manner with NFL selections. COLORADO -7 vs. Hawaii – TGS notes that Hawai’i is traveling to the mainland without power running back Joey Iosefa, and could run into some trouble against a physical Pac 12 team like the Buffaloes. And even though the Warriors have covered five straight against Pac 12 foes dating back to the 2012 campaign, I would like to think this is a solid spot for Colorado because not only is coach Norm Chow’s bunch coming to the mainland, but moving from tropical weather to high altitude will be hard-pressed for those big island boys. I agree here and will lay the chalk. ALABAMA -14′ vs. Florida – Awfully big number to lay against the Gators, but TGS points out that Florida needed three overtimes to fend off Kentucky, which had lost 27 straight in the series. With this one being played in Tuscaloosa, I wouldn’t mind laying this number, especially with quarterback Blake Sims throwing against Florida’s highly suspect defensive secondary. Alabama, which has covered six of seven when hosting SEC foes, also has running backs T.J. Yeldon and Derrick Henry, who both will be rested since they’ve had only 16 total carries in the past two games. They can help balance things out when Sims isn’t aiming for wideout Amari Cooper. I also agree here and will lay the points. NORTHERN ILLINOIS +13′ at Arkansas – It’s very tough to gauge this Northern Illinois team, which has won 17 straight road games, including last week’s visit here in Las Vegas. TGS notes the Huskies have covered 14 of their last 16 during this 17-game run, but I’d be concerned about this team traveling for a third consecutive week. Sure, the first one was in the state of Illinois, but it was still on the road. Then they came to Vegas, and now they’re headed to Fayetteville? I am actually stunned whichever editor contributed to this one picked NIU to win outright, as it could be poised for a beatdown. I’d either lay the points or stay away from this game. WEST VIRGINIA +7 vs. Oklahoma – TGS notes the lines are beginning to inflate when it comes to the Sooners, and the past two years they’ve been able to pull away for the win and cover against the Mountaineers. This one is in hostile territory, yes. And the Mountaineers do have a power rushing game that could keep Oklahoma’s offense to limited time of possession. But don’t discount The Sooners’ stout defense, which ranks 19th in the nation overall, allowing just 295.3 yards per game. Both have a bye week on deck, so there is no look-ahead to worry about. If I were going to play this one, it would have to be on a two-team teaser, and either side would be safe since I think Oklahoma pulls out the win. WISCONSIN -27 vs. Bowling Green – PS notes that even though Bowling Green pulled out a 45-42 win over another Big Ten foe last week, knocking off Indiana, the Falcons did so against a horrendous defense and that quarterback James Knapke won’t have as easy a time this week at Camp Randall, in Madison, against a much better Wisconsin team. The Badgers do a very good job of rotating players, and while they have some big boys up there, they’re also fast and athletic. I don’t know if I’d lay this many points, but I also don’t know if I want to take this number since Wisconsin has won its last six games following a bye week by an average of 34.3 points. I’ll stay away from this one. COLORADO -7 vs. Hawaii – Well you already know how I feel about this one, based on TGS’ pick, but let’s talk about why PS like the Buffs. According to the tout sheet, Hawaii arrives in Boulder after a close 27-24 win over Northern Iowa in a game the Warriors led 24-10 entering the fourth quarter. On the other hand, Colorado is in after a 38-24 loss to Arizona State. Hence, the Buffaloes could be out to avenge last week’s Pac 12 setback. PS also makes note that Hawaii has given two Pac 12 team all they can handle, but those games were in Honolulu and the Warriors now have to travel to Boulder, where Colorado was 3-0 ATS when laying chalk last season. ARKANSAS -13′ vs. Northern Illinois – So while TGS likes Northern Illinois to win outright, PS says the Razorbacks are one of its best bets. The sheet points out that NIU is 1-9 all-time versus the SEC, with the win coming against No. 21 Alabama in 2003. The Huskies’ average loss in those 10 games: a rather high 17 points per game – a number that would sure cover the point spread in this game. PS points out that after snapping their 10-game losing streak two weeks back, the Razorbacks ran roughshod over Texas Tech last week – in Lubbock, Texas – with a 49-28 shellacking. To repeat, I’d either stay away from this game, or lay the points with the SEC entry. The information contained in this article is for entertainment purposes only. The site owner cannot be held responsible for any user activity that violates any local or national laws or jurisdictions. This information is solely the readers’ responsibility to ensure any gambling is legal in your respective jurisdiction. The owner and admin of this site cannot determine the legality of online gambling in every jurisdiction, will not offer or provide any legal advice, or suggest sports books – either online or offshore. The information at this site is for news and entertainment purposes only. Use of this information in violation of any international, federal, state or local laws is prohibited.